Review – Ethan Watters. 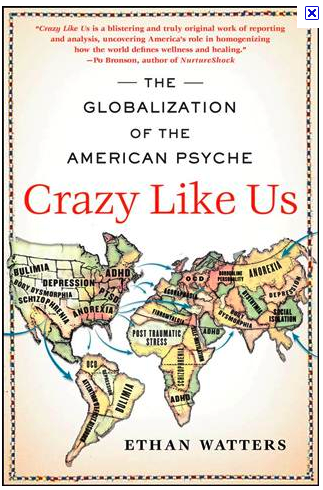 Crazy Like Us: The Globalization of the American Psyche. New York: Free Press, 2010. This book aims to demonstrate how, regrettably, over the last twenty years or so, typically American conceptions of mental illness have been exported successfully to the rest of the world. According to Watters, the often enthusiastic international reception of DSM-III and IV with its standardized descriptions of typical American forms of mental anguish, has homogenized human suffering all over the world. Psychiatry appears to be following the example of McDonald’s, which successfully homogenized (and worsened) the daily diet of humankind. Watters presents his argument with four case studies. The first one focuses on the tragic death of an emaciated 14-year old woman in Hong Kong, who fainted and fell to her death in broad daylight in 1994. When journalists wanted to report on the case, they quickly found out, using Google, about the symptoms and causes of anorexia nervosa. Soon after, awareness campaigns and prevention programs were organized based on Western insights—and lo and behold, the number of young women in Hong Kong suffering from anorexia nervosa increased dramatically. By way of contrast, Watters describes the research and ideas of Dr. Sing Lee, who had studied a small number of women patients who had deliberately starved themselves. Interestingly, they did not display the symptoms of anorexia nervosa. They did not have a morbid fear of becoming overweight, did not have body image issues, and did not starve themselves to look thin and attractive. It appeared that Dr. Lee had found a rare form of mental illness which might be unique to Asia, and which resembled anorexia nervosa, but was a distinct disease entity. Unfortunately, he was not able to cure this condition with the aid of traditional Chinese medicine and other approaches based on local culture. His only patient with this condition died of starvation. The second case focuses on the effort to relieve the trauma of the inhabitants of Sri Lanka after the tsunami. The descriptions of NGOs falling over each other and investing significant resources in turf wars are familiar by now. The conclusion that construction materials were needed more urgently than trauma counsellors can come as no surprise. Nevertheless, Watters judges the influence of these counsellors to be relatively benign—ending his chapter with the bemused smiles of young children drawing and painting, not having the faintest idea of what the art therapist who gave the material to them was up to. The third case study focuses on the way an individual with schizophrenia was maintained by his family in Zanzibar. The narrative is moving but because it only involves one individual, it is hard to make any generalizations. The last study deals with the mega-marketing of depression in Japan. It details the successful efforts of GlaxoSmithKline, the producers of Paxil, to introduce new conceptions of sadness and depression to Japan. Previously, Japanese psychiatry and popular thinking only acknowledged a rare and very severe form of depression, which required institutionalization. Medical anthropologists and open-minded psychiatrists were feted in exclusive holiday resorts and received generous honoraria for their willingness to share their insights with CEOs and marketing experts. A smart marketing campaign then presented new images of depression—after all, experience in the Western world had demonstrated that marketing disease leads to much higher sales that marketing specific cures. The image of depression that was presented to the Japanese public was left deliberately vague, but it was one that could affect almost everyone, in particular the young, the smart, the aspiring, and the successful. Ask-your-doctor commercials appeared everywhere, de-stigmatizing depression and encouraging individuals to take charge of their own condition by requesting prescriptions. At the same time (around the year 2000), as we now know, the evidence in favour of Paxil (and many other SSRIs) remained flimsy, incomplete, and inconclusive. Undesirable side-effects (including, possibly, akathisia, violent behaviour and increased risk of suicide) had been deliberately swept under the carpet. Nevertheless, marketing campaigns do not let questionable science stand in the way of good sales figures. Of course, it should be emphasized that the pharmaceutical industry is very interested in Japan, because it is a wealthy country. This contrasts with its complete lack of interest in many developing nations, which are often deprived of much-needed medications. The chapter on the mega-marketing of SSRIs in Sri Lanka, for example, would be remarkably brief. There is much to commend about Watters’ book. It is a page-turner which hardly ever fails to engage its reader. It is significant that recent developments in the history of psychiatry are discussed—after all, we know an awful lot about the asylum by now, but not much about what happened after the 1960s. Studies focusing on the post-World War II world are still relatively rare, even though significant developments in psychiatry and mental health care have taken place over the last sixty years (deinstitutionalization and the development of psychopharmacology, to mention only two). Also appealing is Watters’ discussion of the “rest of the world.” Thus far, most historians of psychiatry have focused on psychiatry in the Western world. Over the past twenty years, colonial psychiatry has received ample scholarly attention, but studies on this topic have often focused on the activities of Western psychiatrists in far-away places (articulating theories in which “race” took the place of “class”). Unfortunately, the reactions, ideas, initiatives, and theories of the original inhabitants of these far-away places are rarely taken into account. This is exactly what Watters does—although he presents Western (or, more accurately, American) psychiatry as decisively hegemonic. As a consequence, psychiatrists, other mental health care workers, and media types concerned about mental illness in the rest of the world appear almost exclusively reactive. The flow of ideas, however pernicious in its effect, moves from the United States to the rest of the world—and, strangely enough, the rest of the world enthusiastically embraces it, discarding much more refined and interesting indigenous approaches (even though they do not actually work in the examples given in the book—and many more examples of traditional healing methods in the developing world could be mentioned that are inhumane and cruel). The four case studies are sufficiently diverse to compare and contrast responses to mental illness and Western psychiatry. Nevertheless, a feeling remains that the story fits together too well. Criticizing American initiatives has been a favourite activity of academics for some time now—Watters’ analysis therefore has a familiar feel. Nevertheless, one could imagine countless scenarios in which psychiatrists and other mental health care workers in the non-Western world maintain a more level-headed approach to the patients they see (in all fairness, Watters’ ire is mostly reserved for uncritical media types and pharmaceutical corporations, rather than for physicians). After all, many American mental health care practitioners often view picking a DSM-diagnosis as a bureaucratic exercise after which the real treatment can begin. The importance of DSM in many developing countries appears to be somewhat overstated. If the influence of American psychiatric ideas could be diminished, psychiatric anthropologists would be able to conduct more interesting research projects. At least that appears to be Watters’ opinion. His interest in the rest of the world is laudable. Nevertheless, he completely overlooks the fact that in most developing countries, there are hardly any psychiatrists and access to psychotropic drugs is very difficult. As a consequence, many individuals do not receive the care they need and suffer unnecessarily. If Watters’ caution were widely heeded, this situation would likely only worsen. Lastly, why should we be particularly concerned about the disappearance of various culturally-specific forms of mental suffering? Watters compares the disappearance of exotic forms of mental illness (often described as culture-bound syndromes) to the increasing extinction of plant and animal species, which is impoverishing the bio-sphere. The metaphor of disappearing species is not altogether convincing—who would, after all, advocate preserving the current diversity in suffering? Because Watters often appears to be critical of American psychiatry, his descriptions of reactions to mental illness in the rest of the world are often empathic, generous, and positive, while American approaches only appear in a negative light. Seen that way, the pervasive influence of American psychiatric thinking is easily regarded as pernicious—in particular if it is a poor fit with the experiential world of non-American patients. The often cruel and pointless treatment methods that are still widespread in the non-Western world do not find a place within this book. I think that Crazy Like Us: The Globalization of the American Psyche is a good starting point for those who are interested in making sense out of the occasional media information and various disconnected studies saying that people in the West with diagnoses do worse than those in developing nations (WHO studies); that the life span for people with certain diagnoses in the US in the public mental health system is 25 years less than for their cohorts (Colton); that DSM-V is mired in controversy, including intense criticism from the two former editors of the two previous DSM volumes (Spitzer, Frances); that prominent psychiatrists have been censored by their universities and NIMH and that that FDA committees and CME modules are staffed with those who have strong ties with industry (Carlat, Ghaemi, pharmalot). The voices of users and survivors are found in this book, an important aspect of learning what is really going on in this field. The point is that medicalizing human suffering is not humane or effective, and that the objective look we claim to be taking is not at all objective or disinteested. And most people really don’t want this type of medical intervention for their social ills and suffering. I think this book provides a nice overview of some of these issues. Also read Robert Whitakers’ new book: Anatomy of an Epidemic and his old book, Mad in America. I appreciate the main spirit of the book, that the globalisation of DSM categories is problematic. But as Pols points out, Watters’ argument oversimplifies the issue. Many of Watters’ observations resonate with my own research in Aceh, Indonesia, which was also badly affected by the Indian Ocean tsunami. As Watters describes for Sri Lanka, PTSD ‘debriefers’ worked in Aceh after the tsunami, establishing talk back radio programs, doing art workshops for children, and in some cases carrying out counselling. A much smaller number of organisations attempted to support Acehnese psychiatrists and doctors to treat more serious cases of mental illness. These organisations were generally well received by Acehnese people. But as in Watters’ case study they failed to recognise that Acehnese already have well-established practices for addressing trauma. Not only did many of these organisations trivialise the importance religion plays in conceptualising suffering, many went out of their way to interject in Islamic interpretations of the tsunami and to replace them with secular, scientific frameworks. This aspect of these programs annoyed many Acehnese, who saw it as inappropriate and a waste of precious money. But it did little to convince them to abandon their own interpretations of the tsunami or their own trauma healing practices. Like Sri Lanka, Aceh had a long period of violent conflict before the tsunami struck. Because of this, Acehnese have complex and nuanced ways of coping with loss and extreme violence. They were also familiar with the concept of PTSD before the tsunami, since it has long appeared in the Indonesian media. ‘Trauma’ operated as a loanword in the Indonesian and Acehnese languages for at least ten years before the tsunami. So while I agree with Watters that it is deeply concerning that many NGO trauma programs work against rather than with cultural and religious interpretations of suffering, I disagree with his argument that this represents the ‘globalisation of the American psyche’. His own comparison with McDonalds is telling. McDonalds is tacky, but it didn’t really ‘take over the world’. In the same way the growing dominance of psychiatry should be continually critically examined. In my opinion, this is most important outside of a clinical context (as in when lawyers, governments and policy makers incorporate psychiatric concepts into their systems of regulation). But if we are too quick to assume that DSM categories will simply displace other cultural and religious explanations for emotional distress, then we will be poorly placed to be able to see either the positive or the negative implications of the globalisation of frameworks such as PTSD.